And the first thing that comes to mind with our passages from Hebrews and John is that God loves and values us so much that He lowered Himself to become one of us, to live and suffer in a fallen world as we do, and even die the most painful and horrible of deaths in order to save and reconcile us to God. In fact, the underlying themes of Hebrews and John are “faith in the incarnate Son” and “the deity of Christ who has come in the flesh”. For it is only when we begin to know & understand who the person of Jesus Christ really is that we can live in personal relationship with Him. So I’ll give a very general overview of a few of the classic reasons as to how we know that the Son is both truly God and truly man in the one person of Jesus Christ, and along the way, I’ll address a few of the most common questions that result. The Father is God. The Father is not the Son; the Father is not the Spirit. The Spirit is God. The Spirit is not the Father; the Spirit is not the Son. The Son is God. The Son is not the Father; the Son is not the Spirit. This is how God is able to be both the sender of the Son and the One who is sent. We usually refer to the Son’s mission to save mankind as being in 2 phases. (1) Descent or Humiliation: He descended, He freely entered our human condition by becoming flesh and emptying Himself of Divine Glory, except He remained sinless, He taught as a prophet, He served as both priest and sacrifice, was executed on the cross and was buried. (2) Ascent or Exaltation: He ascended; He was resurrected and resumed the full exercise of divine dominion, and now He sits at the right hand of the Father as our mediator and advocate. The Son, Jesus Christ, is one person with two distinct natures – human & Divine. To begin with, both scripture the earliest creedal confessions tell us that the witnesses to the resurrection and earliest Christian communities confessed Jesus Christ as Lord and spoke of Him without qualification as the one God. “No ancient Christian creed fails to confess the deity of Christ.” This was remarkable given their deep roots in Jewish monotheism and religious training. The earliest known creedal statement was, “Jesus is Lord or Kurios Iesous”. It was proclaimed by the earliest Christian Church in Jerusalem and was a direct reference to the use of Kurios in the Septuagint which translated to Yahweh, the name used for God in the Old Testament. The earliest known NT preaching of Christ’s divinity is Paul’s use of this expression in 1st Corinthians. Prior to the resurrection, Kurios could have meant “teacher” or “master”, after the resurrection, “Jesus is Lord” clearly means that Christ is the same one who told Moses “I Am That I Am”. So when the Church Fathers were faced with heresies (just as are we today) proclaiming that Jesus is not true God of true God, they produced the following 5 key arguments from scripture to confirm that Christ must be confessed as truly God. 1. If Jesus Christ is repeatedly addressed in Holy Scripture by ascriptions that could only be appropriate for God, then Christ must either be God or Scripture lacks authenticity. The Son’s is proclaimed in Scripture as “Only-begotten”, “the Way, the Truth, the Life, the Light”, “the Effulgence, the Impress, the Image, the Seal” “Lord, King, He That is, The Almighty” (Gregory of Nazianzus, Orat. 29.17). Paul salutes the church of Corinth with the phrase: “Grace to you and peace from God our Father and the Lord Jesus Christ” (1 Cor. 1: 3). “Matthew identifies him as the same Immanuel expected by Isaiah (Matt. 7: 14) or “God with us” (Matt. 1: 23). 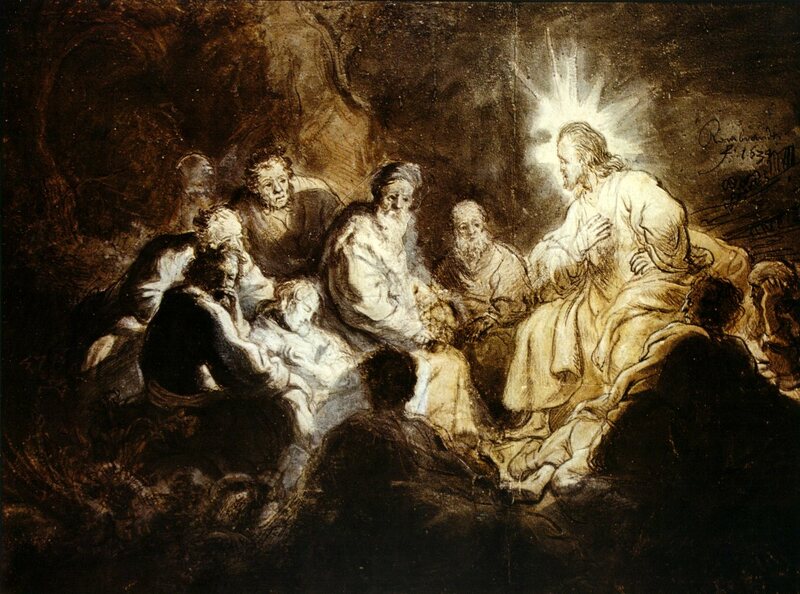 John calls him the only Son of God, “God the One and Only,” the only one to have seen God (John 1: 18). 2. If the Son possesses attributes that only God could possess, and the scriptural witness is true, then He must be God. Augustine comments: ““Do not imagine any space of eternity in which the Father was and the Son was not. Since when the Father was, since then the Son. And what is that ‘since,’ where is no beginning? Therefore ever Father without beginning, ever Son without beginning. And how, will you say, was He begotten, if he has no beginning? Of eternal, co-eternal. by being Himself raised from the dead (Matt. 28: 1– 15; Luke 16: 1– 14). 4. If Christ was worshiped as God and unresistingly received worship due only to God (1 Cor. 11: 24, 25; John 5: 23; 14: 14; Acts 7: 59), then he must either be a blasphemer or God. 5. If the Son of God is viewed by the Apostles as equal to God, and the Apostolic testimony is true, then He must be God. Phil. 2 states that “…Christ Jesus who, being in the form of God, thought it not robbery to be equal with God…” According to John, the reason His accusers were determined to kill him was because “he was even calling God his own Father, making himself equal with God” (John 5: 18). II. Being fully God, Jesus Christ is at the same time fully Man. All the familiar elements of human nature are found in Jesus: body, soul, will, and spirit. Scriptures speak of a real person having all things requisite for human existence, not an ephemeral but a real body, not an angelic but a rational human soul. Everything that we as human beings experienced in the normal course of being human, Jesus also experienced, sin excepted. The Gospels constantly portray him as living a thoroughly human, bodily existence: he was conceived in a womb and born when a census was being taken. He had male reproductive organs, circumcised when he was an infant according to law. He grew in stature— he did not come full grown. He got hungry, thirsty, and weary. He felt exhaustion when his bodily powers failed, and he was unable to carry the cross. He was wounded and hurt when nailed to the cross. The most decisive proof of his humanity is simply that he died. There is no doubt either to the eyes of faith or to historical investigation that Jesus died. The death of Jesus unmistakably marks him as one of us (Matt. 27: 50). Virtually everyone who reads the NT asks the question “Why did God become man?” And logically, the short answer is that “It was quite impossible for him to save man in some other way”, since fallen humanity needs an impeccable divine mediator who shares our human condition. “There can be no mediation between God and humanity without positing a Mediator capable of empathy with ordinary humanity and of equal dignity with God (Phil. 2: 6– 11; Heb 2: 17– 18). As divine Son, His act of sacrificial offering has infinite value to the Father (Heb. 4: 15). If the one who died on the cross were only human and not the Divine Son of God, the death could not serve sufficiently as an act of atonement for the whole world. Why did God spend thousands of years preparing us to receive Him, become man, suffer, and die for us? The overarching reason is because of His inestimable love for us; He values each and every one of us, sinners and saints, that much. Such is the shape and abundance of God’s unconditional love. This is what is happening in our readings today, God’s keeping that same promise to us no matter what, when it seems it would have been so much easier for Him to simply throw us away and start over, or not. Reflecting on our passage from Jeremiah, when God promises mankind a new covenant whereby the law of love is written in our hearts and minds, it is because of and through the incarnate Son that it is possible for human history to move from a time when “God was for us” to “God within us”. And isn’t that the whole purpose of being Christian, the whole purpose of accepting God’s offer of salvation & entering into an eternal love relationship with Christ? Many protestant denominations call this “becoming fully sanctified”; the Orthodox use the expression “becoming Gods by grace, not by nature”. The biblical definition of love is: “To value as God values”. We are to love as Christ loves in thought, word, & deed. Love is also an act of will which is commanded by God. (Jesus’ summarizes the Law as: “Thou shalt love the Lord thy God with all thy heart, with all thy soul, and with all thy mind. This is the 1st and great commandment, and the 2nd is like unto it: thou shalt love thy neighbor as thyself. On these 2 commandments hang all the law and the prophets.”). We are told that God is love, and if we say we love God and do not love our fellow human beings, we are liars (1 John 4:20). We are able to love God and our neighbors because God loved us 1st. It is by loving others as Christ, the incarnate Son, loves us that we show our love to God. Oden, Thomas C. (2009-07-23). Classic Christianity (Systematic Theology) (multiple pages). Harper Collins. Kindle Edition. Nelson, Thomas (2008-02-28). The Orthodox Study Bible: Ancient Christianity Speaks to Today’s World (multiple pages). Thomas Nelson. Kindle Edition. Oxford University Press; The 1928 Book of Common Prayer (p. 1). Oxford University Press. Kindle Edition.